The focus (no pun intended!) 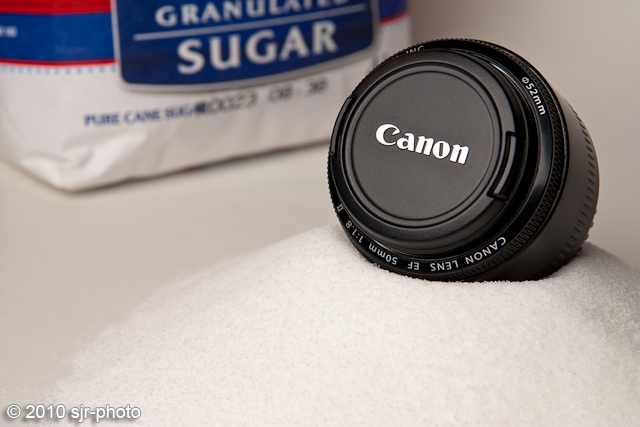 of this article is how to find the “sweet spot” of a lens. The sweet spot refers to the aperture setting of a given lens that yields the best overall sharpness from the center to the edges. Most good quality lenses will give you good sharpness at the center regardless of what aperture you use, but for the best edge-to-edge sharpness we need to dig a little deeper. Testing each of the lenses that you shoot with will give you a better understanding of how your lenses work and knowing where the sweet spot is will help out in the field. Now, just to be clear, I am not recommending that once you determine where the sweet spot is that you shoot at that aperture exclusively, what fun would that be? Instead just add that bit of knowledge to your tool belt and in the field when you need it you’ll have it. This test should only take about 30 minutes to complete. A digital SLR camera with the lens that you want to test. A piece of newspaper (try and choose something that has a lot of text like the classified section). You may also need a light source of some king depending on the area you have access to. If that is the case any constant light source will do, we are not going for accurate color here so don’t worry about white balance. We just need it to be bright enough, and desk or table lamp should work fine. Now, tape the newspaper up on a wall ensuring that it is as flat to the wall as possible. If the light is required then set it up and shine it on the newspaper. Next, set up your tripod with the camera on it at a distance that will allow you to fill the frame with the newspaper. Set your camera on aperture priority mode and set your ISO to 200 (this will allow for the best quality images for review). Set your aperture to the maximum that the lens will allow. Depending on the lens that you are testing the minimum and maximum aperture values will differ. For the purpose of this article I will be using the Canon EF 50mm f1.8 II. The maximum aperture of this lens is f1.8 and the minimum aperture is f22. Next, focus the lens on the newspaper. Autofocus should be sufficient for this but, if your camera has a live view function you may want to take advantage of that to ensure that the focus is exact. TIP – If you are having difficulty focusing, ensure that you are not too close to the target. Every lens has a “minimum close focusing distance” if you are too close, it won’t focus. Our subject lens has a minimum close focusing distance of 1.5 feet or 45.72 centimeters. It is imperative that we remove any additional variables from the test to ensure the most accurate results. For each exposure we will us the 2 second timer function to prevent there being any issue with vibration from pressing the shutter (this will become more important as we get closer to the minimum aperture). DON’T MOVE THE CAMERA! If for some reason the dog or one of the kids happens along and hits your tripod while you are in the process of testing don’t despair, just reset and reshoot, this test doesn’t take that long (not speaking from personal experience here!). Next we want to take a series of images carefully adjusting the aperture down by one stop on each subsequent exposure (example – f1.8, f2.8, f4.0, f5.6, f8.0, f11, f16, f22). Once we have completed each of the exposures it’s time to download the images and have a look! 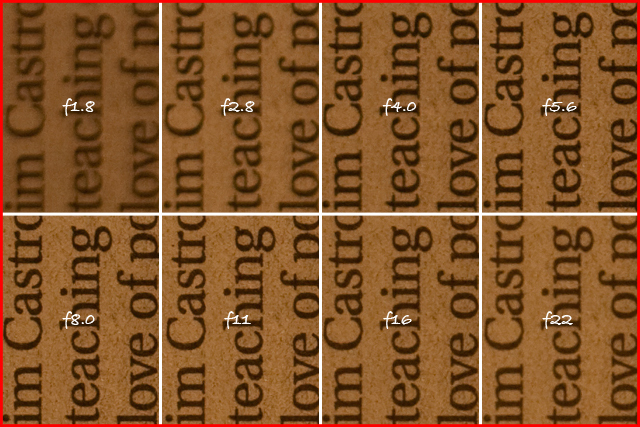 The above image shows 100% crop examples taken from the bottom left corner of each of the images. Upon review we can see that the image taken at f1.8 is downright smarmy! Sharpness improves at f2.8 but is still soft. f 8.0 OUCH! That’s sharp. Well based on the above examples, this particular lens offers the best overall sharpness at f8.0, but the anywhere between f4.0 and f11 is more than acceptable considering that most of the images that I would use this lens for would be posted online or printed to a maximum size of 5×7. When I shoot this lens I tend to keep around f4.0, but I will often drop down to f2.8 or even f1.8 as the center of the image is still quite sharp at that aperture and sometimes the soft edges can lend to the effect of the shallow depth of field, particularly in portraits where the focus is on the subject’s eyes. I have tested all of my lenses and it has paid of on more than one occasion. As a general rule, most lenses offer good edge-to-edge sharpness at around f8.0 but it is important to test all of your lenses, the results may surprise you! Steve is a Ontario, Canada based freelance photographer, teacher and author of the weekly photo blog “From Where I Stand” covering news, reviews, tips and tricks on digital photography. You can also catch Steve on Twitter as @sjrphoto. very nice tutorial. i really never thought about doing this until i read your post. up until now, i just use the common rule of “largest aperture + 2 stops” as the guide to get sharpest image. definitely gonna try this. Ok the lens sharpness has been determined at that distance but would the sharpness be the same for, say, a landscape shot? Good to know…I just assumed it was around f/8 or f/9 for all lenses. No, a practical approach is to set most frequent focus distance for every lens. Besides, for more exact results use mirror lockup, RAW format developed with corrected aberrations. The area of 100% peep should be located acc. to typical use of given lens, not necessarily in corner. Fantastically helpful article, thanks so much!